WBC Champion Mairis Briedis (90,1 kg) (22-0, 18 KOs) and Mike Perez (22-2-1, 14 KOs) (89,5 kg) are ready for Saturday’s Ali Trophy quarter-final at the Arena Riga, Latvia. “I can’t wait for tomorrow,” said Briedis, the WBC champion who was supported by a loud crowd of Latvian countrymen at Friday’s weigh-in Riga. There are still a limited number of tickets on sale at https://shop.piletilevi.ee. 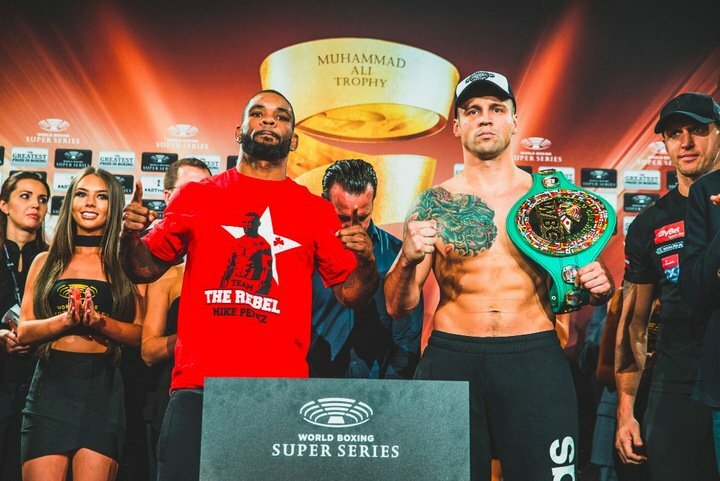 The start time for this Saturday’s airing in Canada of additional World Boxing Super Series (WBSS) tournament action, featuring World Boxing Council (WBC) Cruiserweight World Champion Mairis Briedis (22-0, 18 KOs) against challenger Mike “The Rebel” Perez (22-2-1, 14 KOs), is 2 p.m. ET / 11 a.m. PT, exclusively on Super Channel live from Riga Arena in Riga, Latvia. Preliminary bouts will start airing on Super Channel at 2 p.m. ET / 11 a.m. PT, the Briedis-Perez main event is scheduled to commence at 5 p.m. / 2 p.m. PT. World Boxing Super Series Coming to U.S. TV! Fans across the United States will have the opportunity to watch World Boxing Super Series action throughout the remainder of the quarter-finals as AT&T will broadcast this round of the tournament on AUDIENCE Network and other AT&T platforms, beginning with Saturday’s Mairis Briedis vs. Mike Perez WBC World Championship showdown from a sold out Riga Arena in Riga, Latvia.